Combining TwinMesh and ANSYS CFX offers engineers a unique, efficient, and fast workflow for transient, three-dimensional computational fluid and thermal analyses of gerotor pumps, lobe pumps, gear pumps, and screw compressors at maximum reliability. 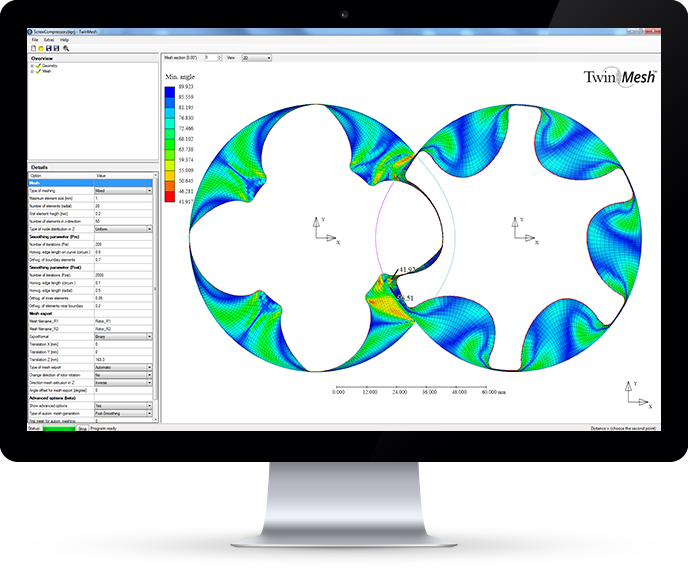 TwinMesh is a novel meshing software for positive displacement (PD) machines with one or two axially parallel rotors and continuous (e.g. gerotor pumps) or discontinuous (e.g. screw compressors, lobe pumps) rotor geometries. Our software automatically generates high quality structured meshes of the rotating parts of PD machines and eliminates common numerical limits. TwinMesh drives real innovation in the field of PD machines helping engineers to realise a faster time-to-market, higher machine quality, longer durability, and decreasing development costs. Join our next free TwinMesh webinar on 9th of July 2019 at 3pm (CEST): find out more about how TwinMesh and ANSYS CFX allow for reliable 3D CFD analysis of rotary positive displacement machines such as screw compressors, lobe pumps, vane pumps, Wankel engines, gear pumps, progressive cavity pumps, or scroll expanders!